Following the success of ICEM’s SEA on the Mekong Mainstream, ICEM has been commissioned by the Asian Development Bank to complete a Strategic Environmental Assessment (SEA) to assess the GMS Power Transmission Master Plan and alternative GMS energy futures and their effects. The SEA will guide future energy policy options and propose ways of improving the environmental and social sustainability of the GMS power plan. The SEA also provides guidance for more specific assessments at the national, sub-national and project level and throughout the process builds the capacity of GMS Energy Planning Agencies and Utilities to undertake SEAs. The project will be run over 15 months and commence with an inception workshop to be held in Hanoi from March 14 – 18. ICEM in partnership with NIRAS has been contracted by the Asian Development Bank to provide Support for the National Target Program (NTP) on Climate Change with a Focus on Energy and Transport in Vietnam. It is a two year project that commenced in February 2012 with inception workshops held in Hanoi. The project is one of the first projects in South East Asia of its scale to integrate mitigation and adaptation planning. The project aims to contribute to the effective implementation of detailed NTPCC Action Plans by the Ministry of Industry and Trade, Ministry of Transport, Thanh Hoa Province, Ho Chi Minh City, and Da Nang City to reduce the growth rate of GHG emissions from energy and transport sectors by 2020 and reduce infrastructure and productivity losses in the urban sector. The project will also aim to increase the capacity of the target ministries, province, and cities to design and implement climate change adaptation and mitigation response measures. The final regional workshop for the Mekong River Commission Wetlands and Climate Change Project was held in Phnom Penh from the 2-3rd of February 2012. ICEM with its partners IUCN, World Fish and SEASTART brought together wetlands and climate change experts to develop regional climate change adaptation options for the Lower Mekong Basin Wetlands. During the workshop, the ICEM team presented the findings of the climate change vulnerability assessment of wetlands in the Lower Mekong Basin; discussed adaptation options for better management of wetlands in the face of climate change; and developed a road map and recommendations for implementing wetland climate change adaptation. The findings of the workshop will be integrated into the final impact and vulnerability report and project synthesis report that will be completed at the end of March 2012. The Pacific climate change adaptation project is now in its final stage as the governments review the final reports produced for each of the five countries – Palau, Marshall Islands, Timor L’este, Fiji and Solomon Islands. Five national reports and one regional report were produced that set out the methodology and define adaptation priorities for each of the countries. Each of the countries identified key geographic areas of strategic national importance and sectors that formed the basis of climate change impact and vulnerability assessments that led to the development of pilot adaptation projects. The reports will be finalised and made available in the coming months. As part of Project 3, ICEM has been looking at multiple use strategies for water in reservoirs for other uses such as local irrigation, recession agriculture, fisheries, water supply and tourism that can have important values for local communities and local economic development. ICEM has looked at cropping patterns and modelled the potential use of reservoir waters for use in irrigation across landscapes and agricultural land along the Sesan River in Vietnam and Cambodia. Our experts have found that only a very small area of agricultural land would benefit from gravity fed water for irrigation. The possibilities for pumped water use and terracing has not yet been assessed, much greater potential exists. Initial findings were presented in Johannesburg at the 3rd International Forum on Water and Food late last year. ICEM’s conference poster “Scoping for sustainable multiple use of water in cascades of hydropower schemes in the Sesan River Basin” that was developed with the Challenge 3 project partners is available on our publications page, or by clicking here. The results will be made available in a report to be completed in May 2012. ICEM has been commissioned by the Vietnam National Mekong Committee and Ministry of Natural Resources and Environment in Vietnam to design a study assessing the impacts of Mekong mainstream hydropower development on the Mekong Delta of Vietnam. The Delta Study is in accordance with the Government of Vietnam’s commitment to undertake a study of the upstream influence of hydropower and irrigation in the Mekong Delta as recommended in the MRC SEA of hydropower completed by ICEM, and to build a suitable scientific evidence base for decisions on the sustainable exploitation of Mekong River. ICEM will design a 3 million USD study and support the Government of Vietnam in the recruitment of the firm to undertake the Delta Study. The 3rd International Forum on Water and Food hosted by FANRPAN and IWMI took place from November 14-17, 2011 in Johannesburg, South Africa. ICEM produced a conference poster “Scoping for sustainable multiple use of water in cascades of hydropower schemes in the Sesan River Basin” that was presented at the conference. The poster was developed with the Challenge 3 project partners and is available to be downloaded on the ICEM publications page. ICEM has developed a Water pollution control funds in Vietnam Brief to explore the role of environmental funds for helping control water pollution in Vietnam. The brief is based on the findings and recommendations from a number of our recent reports on pollution and pollution control in Vietnam –including a national audit of pollution in manufacturing industries and review of pollution control legislation, planning and administration in Vietnam conducted by ICEM for the World Bank (ICEM 2007); a survey of financing demand amongst polluting establishments, financing mechanisms for pollution control and the costs of wastewater treatment in Vietnam conducted by ICEM for JICA Vietnam (ICEM 2010a); a study of revolving funds for water pollution prevention also for JICA Vietnam (ICEM 2010b); and, research by ICEM for the Asian Development Bank (ICEM 2008) and by the World Bank on point source pollution issues in the Nhue-Day and Dong Nai river basins (LBCD 2010). Many of ICEMs reports and briefs can be downloaded on the ICEM publications page. The Water pollution control funds Brief is also available by clicking here. ICEM spoke at a recent seminar on mainstream hydropower organized by VUSTA – Vietnam Union of Science and Technology Associations: Xayaburi Hydropower Project – Gains and losses to the Lower Mekong Basin. The workshop, held on November 23, 2011 in Ho Chi Minh City, is part of VUSTA’s program to open dialogue between Vietnamese and regional scientists and reach mutual understanding on the impacts of Mekong mainstream hydropower development. Conclusions of the workshop will be presented to government officials and representatives as an input into the decision-making process. ICEM’s Tarek Ketelsen presented the findings and recommendations of our review of the Xayaburi HPP Compliance Report (prepared by Poyry AG in August 2011). To find out more about Mekong mainstream hydropower please visit our MRC SEA of mainstream hydropower page. The presentation given at the VUSTA seminar is available by clicking here. ICEM was commissioned by MRC to undertake an SEA of 11 planned hydropower dams along the mainstream Mekong River. The SEA ran for 12 months and assessed the wider economic, social and environmental implications of the proposed developments. 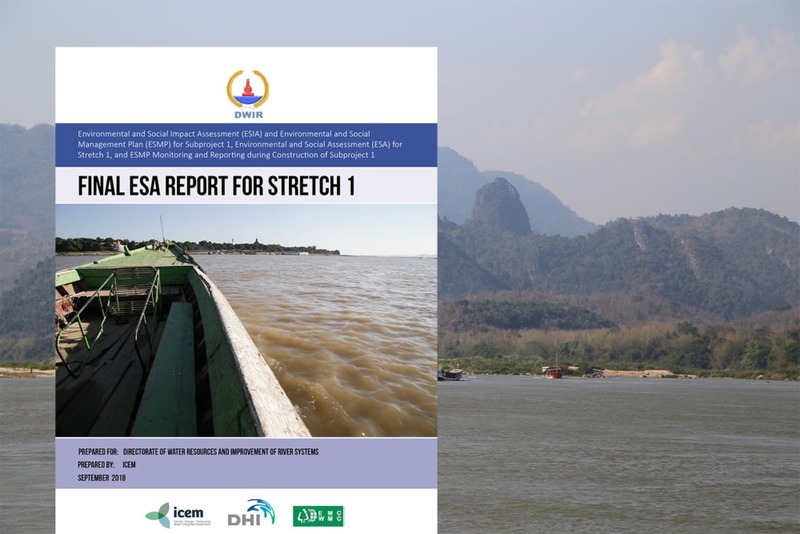 The final SEA report is now available to download in Vietnamese by visiting our MRC SEA of hydropower page, or by clicking here. The Vietnamese translation was completed in collaboration with Pan Nature. The findings of the SEA have also been presented to wide range of stakeholders by the ICEM team. In November, 2011, ICEM presented its findings at the Viet Nam National Mekong Committee National Dissemination Workshop on the Results of MRC SEA of Hydropower on the Mekong Mainstream. The presentation given at the workshop is available on our MRC SEA of mainstream hydropower page or by clicking here. ICEM will also present the SEA findings to the NGO Forum on Cambodia at the National Conference on Climate Change, Agriculture, and Energy to be held from December 1 – 2 in Phnom Penh, Cambodia. Members of the ICEM team completed their third and final field mission in support of KBR and ADB for a regional project in the Pacific to strengthen the capacity of island countries to respond to climate change. The project Phase 1 involves five countries – Palau, Marshall Islands, Timor L’este, Fiji and Solomon Islands and is expected to be completed at the end of 2011. The project includes national and regional workshops, climate change impact and vulnerability assessments and the design of pilot adaptation projects for implementation in Phase 2. The final field mission for the World Bank Water and Sanitation project: Drinking Water Management in Rural Areas was recently completed. Over the last 6 months ICEM has facilitated the development of Water Safety Plans in the two pilot project villages, Poung Neua Village in Khammoune Province, Phone Gnam Village in Bolikhamsay Province. During the mission, ICEM evaluated the success, lessons and barriers to their innovative approach to water safety planning. The results will be synthesised in the final project report and presented at the Regional workshop scheduled for February 2012 in Vientiane, Lao PDR. ICEM has completed a five volume series of good practice materials on “Biodiversity and Development of the Hydropower Sector: Lessons from the Vietnamese Experience”, sponsored by a grant from the Critical Ecosystem Partnership Fund (CEPF) and administered by the BirdLife International Indochina Programme in Vietnam. The series is designed to widen understanding of the relationship between hydropower and biodiversity, and to provide guidance on the use of SEA as a planning tool. These resource materials are intended to support hydropower as a central part of Vietnam’s power generation sector for decades to come, without contributing to destruction of the nation’s rich biodiversity. The series is available to be downloaded on the ICEM publications page. In late 2011, ICEM will commence an assessment for the ADB of potential climate change impacts to the Cao Lanh and Vam Cong Bridges and connecting road. It is the first climate change assessment in the Mekong region to be undertaken concurrent with the detailed design phase of major infrastructure – allowing recommended adaptation options to be integrated into the project life-cycle at the outset. ICEM’s assessment of infrastructure vulnerability and proposed practical adaptation options will lead to this ADB study being a landmark pilot for climate-proofing transport infrastructure in the region. The second regional workshop of the MRC Wetlands and Climate Change Project was held in Hanoi, Vietnam from 11-12 July 2011. ICEM with its partners IUCN, World Fish and SEASTART brought together experts in wetlands of the Mekong Basin and climate change to present the overall study, initial findings from the case studies and lessons and ideas drawn from these case studies that can guide the study teams in developing adaptation mechanisms. To download a summary of the workshop, please click here. Presentations were given by a range of experts from the region including members of the study team. The Lao mission for the Water Safety Planning training of trainer and orientation program ran from 18 – 27 July 2011. The Drinking Water Quality Management in Lao project develops and tests improved institutional and operational arrangement for safeguarding the quality of water in rural areas of Lao PDR based on the combined experience of Vietnam, Cambodia and Lao PDR. The training and orientation workshop delivered an overview of the principles for water safety planning and the methodology and innovative approach for the implementation of the project for key stakeholders and provided training to provincial level trainers. A field mission to the case study site of the Yali Reservoir, Vietnam was completed by the ICEM partner organisation CIEM from 8 – 12 August 2011. The project partners WorldFish, CIEM and ICEM also met in Hanoi in July 2011 to define a project methodology for Vietnam. The MK2 project undertakes an economic valuation of catchment water resources for user groups. ICEM leads the development of a model approach to quantify water availability to each group under different strategies. Members of the ICEM team will complete the second six week field mission in support of KBR and ADB on a regional project in the Pacific to strengthen the capacity of island countries to respond to climate change. The project Phase 1 involves five countries ­– Palau, Marshall Islands, Timor L’este, Fiji and Solomon Islands and is expected to be completed at the end of 2011. The project includes national and regional workshops, climate change impact and vulnerability assessments and the design of pilot adaptation projects for implementation in Phase 2. The first regional workshop of the MRC Wetlands and Climate Change Project was held in Vientiane, Laos from 1-2 March 2011. ICEM with its partners IUCN, World Fish and SEASTART brought together experts in wetlands of the Mekong Basin and climate change to discuss the overall study and criteria for case study selection, to select case study sites, and to provide advice on case study activities. Presentations were given by a range of experts from the region including members of the study team. To read more about the workshop or download any of the presentations given, please click here. ICEM’s director, Dr Jeremy Carew-Reid recently returned from a six week field mission in support of KBR and ADB on a regional project in the Pacific to strengthen the capacity of island countries to respond to climate change. The project Phase 1 involves five countries ­– Palau, Marshall Islands, Timor L’este, Fiji and Solomon Islands and is expected to be completed at the end of 2011. The project includes national and regional workshops, climate change impact and vulnerability assessments and the design of pilot adaptation projects for implementation in Phase 2. ICEM is working with the MRC to identify important terrestrial and aquatic biodiversity and natural system assets on the Mekong River Tributaries. To date development has proceeded in the Basin without adequate information on what needs to be maintained and enhanced. . Led by ICEM’s natural system specialist – Peter-John Meynell, the study will build on the concept of a multivariate analysis showing how ‘significance’ may be evaluated in terms of hydrology as well as other criteria, relating to biodiversity importance, water-quality, aquatic ecosystems, and fisheries. The study will involve identifying ‘bio-diversity hotspots’ in the Mekong and a review of methodologies used to assess significance of aquatic and terrestrial ecology in the Mekong river-system. The Cambodian field mission for the MK3 project ran from 30 April – 7 July 2011. The MK3 project focuses on exploring the multiple use potential of reservoir cascades on the Sesan River and their development and management in an ecologically sustainable manner. The project will take a whole catchment approach and utilise agro-ecological zoning to understand the sustainable potential use and users of the river’s water resources with a focus on hydroelectricity, irrigation, water supply, navigation, tourism and environmental flows and will then develop a suite of models to optimise the operation of cascades for multiple use.The purpose of the field mission was to launch MK3 activities with provincial partners in Stung Treng and Rattanakiri Provinces, Cambodia and included a stakeholder workshop. The field mission report will be released in July 2011. ICEM spoke at the first CSCAP Study Group on Water Resources Security held in Hanoi. The study group focuses on protecting water resources in Vietnam, Laos, Thailand, Myanmar, Cambodia and China and recommending ways to enhance cooperation among stakeholders and establishment of regional mechanisms to manage water in a sustainable manner. The Group encourages participation by international partners in collaborative projects.ICEM’s Tarek Ketelsen presented ICEM’s findings and recommendations from the MRC SEA of hydropower on the mainstream Mekong. To find out more about the MRC SEA of hydropower please visit our projects page or click here. The presentation given to the CSCAP is also available by clicking here. In December 2010, ICEM completed a rapid assessment of the potential threats and impacts of climate change to the O Mon IV (one of 5 power plants in the O Mon power complex at Phuoc Thoi and Thoi An ward, O Mon district, Can Tho City) for ADB. The assessment methodology utilised in the study adapts the ICEM CCAM – Climate Change Adaptation and Mitigation methodology with four key principles: confidence in impact, identifying levels of uncertainty, comparable methodology and phasing response. The result reveals that the impact of climate change on O Mon IV is one of reduced performance and compromised operating processes, not damage or loss in assets. The study concludes with priorities for adaptation and several recommendations for the immediate next steps. In December 2010, ICEM and its partner, Integra Consulting Services, completed the final SEA report on the Vietnam Forestry Master Plan 2010 – 2020. The SEA provides a rapid assessment of three Provincial Forest Protection and Development Plans and guidance for the development of the National Forest Sector Master Plan and for wider decision-making in the forestry sector in Vietnam. It focuses on five major issues: biodiversity, livelihoods in forest land, water retention capacity of forests and protection against extreme climatic events, timber and wildlife trans-boundary trade and forest carbon stock. In conclusion, a set of fifty-two recommendations with fifteen priorities are identified for the consideration by the Government of Vietnam, MARD and its Department of Forests. ICEM has recently completed a study on the design of funding mechanisms for water pollution control in the Dong Nai River Basin and Da Nang City, Vietnam for JICA. The study focused on the worst point sources of pollution, identified in provincial ‘blacklists’ of polluting establishments. The study looked at the legislative and institutional context for pollution control and gathered data from 52 establishments in four provinces on water pollution control needs, the costs of pollution control and the ability of these polluters to fund water pollution control investments. ICEM has just completed a review of the causes, impacts and adaptation options to saline intrusion on the Mekong Delta. Recent droughts and increasing extraction of water (from aquifers and surface water sources) is leading directly to increasing incidence and extent of saline intrusion on the Mekong River Delta. Sea Level Rise and possible increases in the frequency and severity of droughts due to Climate Change are likely to make saline intrusion worse. ICEM and its partners IUCN, World Fish and SEASTART have been commissioned by the Mekong River Commission to conduct a study during 2011 of wetlands in the Mekong Basin and the impact of climate change on their productivity and functions. The Lower Mekong Basin contains rich and extensive areas of wetlands, estimated to cover 6–12 million hectares of the entire lower basin. ICEM recently completed a study for JICA to propose a revolving fund mechanism for facilitating household sewerage connection in the Thu Dau Mot Town (Binh Duong Province) and Vinh Yen Town (Vinh Phuc Province) where separate sewerage systems are being developed. In early 2011, ICEM will commence a 13 month project for the World Bank to help safeguard rural drinking water quality in Lao PDR, taking experience from Vietnam, Cambodia other related countries. The project will include pilot studies in two provinces to develop, test and refine operational arrangements for drinking water management. ICEM has completed a study on Biodiversity and development of the Hydropower Sector: Lessons from the Vietnamese Experience sponsored by a grant from the Critical Ecosystem Partnership Fund (CEPF). Volume I reviews the relationship between hydropower and its effects on biodiversity as distilled from a number of Strategic Environmental Assessments conducted in Vietnam. A major expansion of the hydropower sector is transforming the aquatic systems of the country. All main river systems are or will be dammed by one or more hydropower projects – each with road access and transmission lines and linked development shaping the terrestrial, aquatic and social environment. The overall effects on biodiversity of Vietnam’s comprehensive hydropower development will be significant – involving a total transformation of the nation’s aquatic systems and a reshaping of large segments of its terrestrial systems. This study sets out avoidance and mitigation measures and provides guidance of the application of SEAs in the sector. ICEM Principal Environmental Economist, Benoit Laplante participated in the 2010 MENA Regional Conference on Environmental Challenges held in Morocco. The conference is part of a program of research/capacity building initiated by the Economic Research Forum (ERF), with the assistance of the International Development Research Centre (IDRC). A range of topics were discussed including: renewable and non-renewable resources, pollution, land conservation, and climate change in the Middle East and North Africa Region. Benoit Laplante participated as a discussant on the Climate Change Panel on the implications of environmental economics research for policy making. ICEM, together with its consortium partners, has been awarded three Basin Development Challenge research projects in the Mekong Basin. The overarching goal is to reduce poverty and foster development through management of water for multiple uses in large and small reservoirs. Funded by CGIAR, the projects bring together more than a dozen of the leading research institutes and think tanks in the Lower Mekong Basin.